I’ve known Rick Honeyford close to 20 years. He is a weekend warrior and weight loss phenom. He is also the Founder and President of Honey Financial. Rick has been working in the financial industry since 2001. He is a Certified Financial Planner and a Registered Retirement Consultant. Rick’s sports history dates back to university years when he played rugby for the Balmy Beach Club. Extra weight was a major benefit in those days since being heavier provides added leverage on the field of battle. The challenge for Rick was after his playing day ended. He continued gaining weight – his fast pace and growing career didn’t help as it negatively impacted his eating habits. He rarely cooked for himself or exercised, and often ate at fast food restaurants which provided less than optional food choices. Rick had an epiphany when he went for a sleep apnea test. He stepped on the scale, and was shocked when it read 385 pounds. His condition was so severe that he required a sleep apnea machine. He was 42 at the time and this was his turning point in his life. Although he still ate at fast food outlets, he cut his calories and reduced his soda intake. 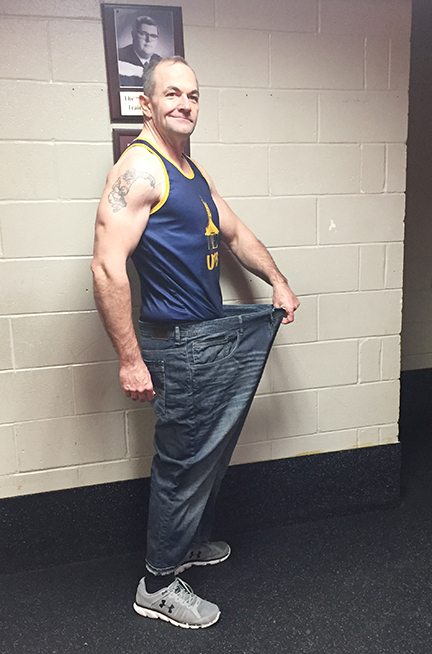 It was a relatively easy way to lose the first 50 pounds but additional progress would require additional changes to his lifestyle. That is when Rick started hitting the gym at the Balmy Beach Club. He started by working out twice a week and he was so encouraged by his transformation that he soon began working out daily. The new trimmed and chiseled Rick, required an entirely new wardrobe as can be seen by attached picture. Today Rick is an active volunteer at the Balmy Beach Club. His community is very proud of him and his accomplishments and supports him wholeheartedly. I recently Rick at a Blue Jays game and I didn’t recognize him. Losing that amount of weight is a huge accomplishment. To me, the most important part of tackling a huge goal is to break it down into manageable bite-size actions. I also really like Rick’s point about treating your workouts like a business appointment. I have been applying this principle for years and I think it is what has allowed staying on track.